After a great start to our journey and a long night of world cup celebrations in Amsterdam, we passed out on the train heading east to our next destination. Taking a step inside of Baxpax downtown hostel brought on even more surprises. The entrance to the 5 story hostel resembled a sports bar, with a comfortable lounge area surrounding a bar, several flat screen TVs for prime World Cup enjoyment, an outdoor patio, and a game room with foosball and ping pong tables. Just as we thought that it couldn’t get any better, we discovered that there was a rooftop lounge area with another bar, hammocks and even more flat screens. It would be a challenge to leave this environment over the ensuing days! As difficult as it was, we did eventually make our way into the city. 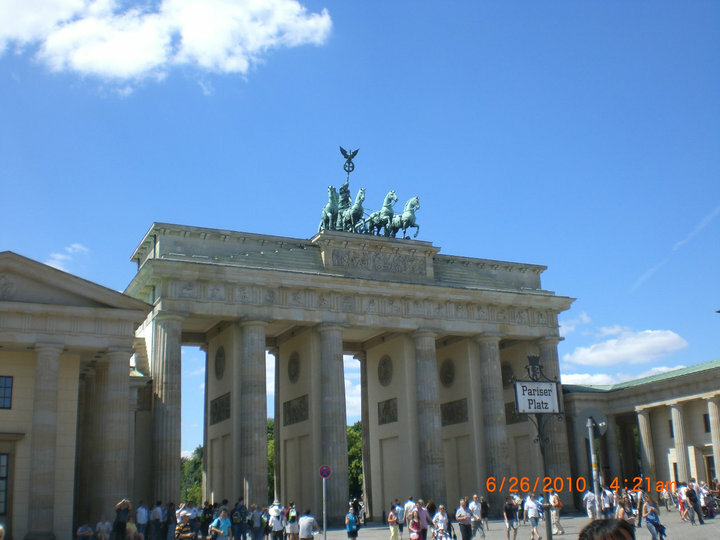 Looking back on our time in Berlin, most of our activities consisted of eating, relaxing, walking, and sightseeing, in order of time dedicated to each activity. 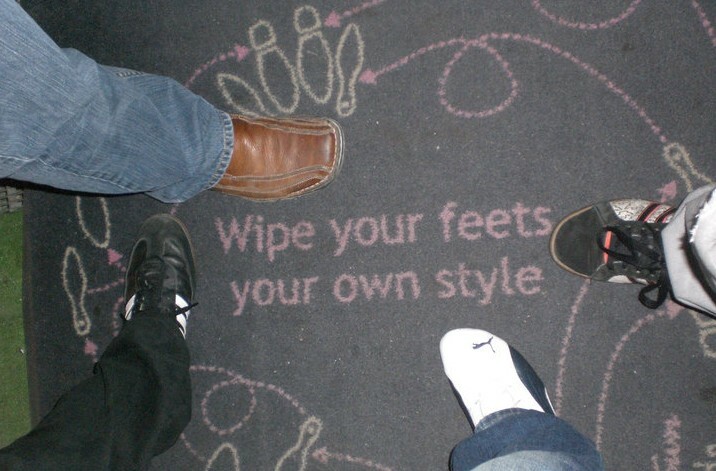 So, let’s proceed in that order. 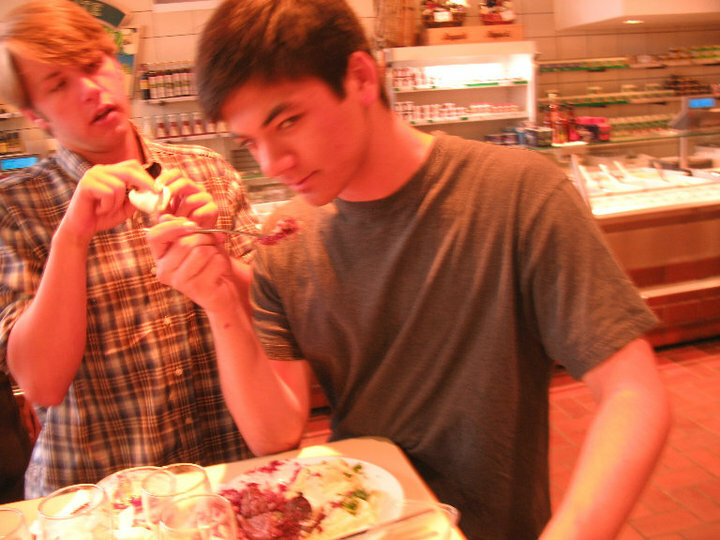 Our revered idol, Anthony Bourdain, deserves most of the credit for influencing our gastronomic excursions. After watching his Berlin episode of “No Reservations”, we made the hike out to two fairly remote locations. The first was to experience the well known and applauded German fast food dish, currywurst, which consists of steamed and fried Wurst, or pork sausage, served with fries and curry ketchup, usually considered street food. Following in Bourdain’s footsteps, we found Konnopke’s Imbiß situated underneath a metro line and squished between three busy streets. The fries were definitely no Chipsy King, but with the combination of delicious sausage and spicy ketchup, we were all pleasantly satisfied and went back for seconds (and thirds)! To wash it all down, we headed to an absinthe bar just down the street, one for Bourdain to add to his list. 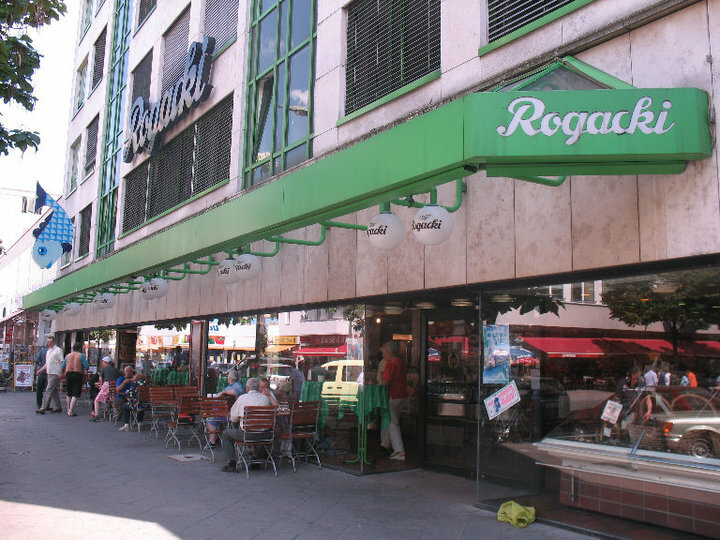 Our second hike took us to a residential district on the outskirts of Berlin where we found the locally (and thanks to Bourdain, internationally) praised Rogacki Delicatessen. With major culinary activities out of the way, on to relaxing! 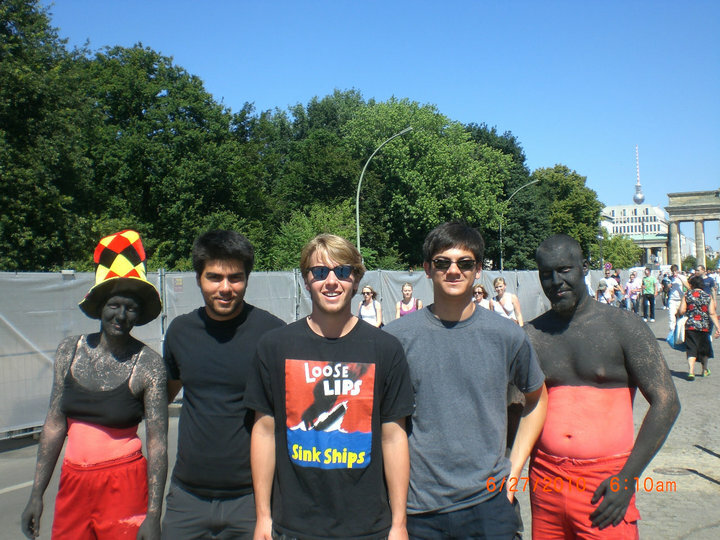 Our second day in Berlin coincided with Germany’s “Round of 16” World Cup match against England. 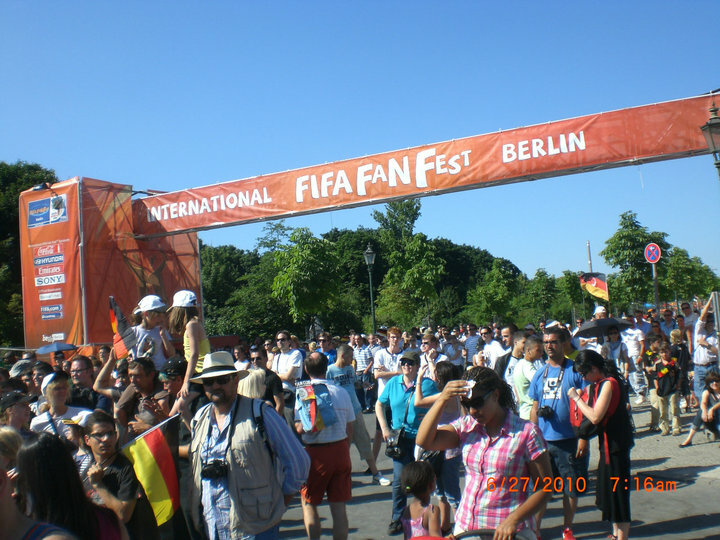 As it was a Sunday, football fans in Berlin took to the streets to watch the game on the big screen, which was set up near the city center. We joined the hoards of excited fans who were equipped with horns, hefeweizen and German flags, and marched along. Although we couldn’t work our way through the hundreds of adamant spectators to see the game, the energy and celebration was ubiquitous, so we joined in the cheering as Germany soared to a 4-1 win! A fair amount of our time was spent near our hostel, discovering the surroundings with a few new friends. 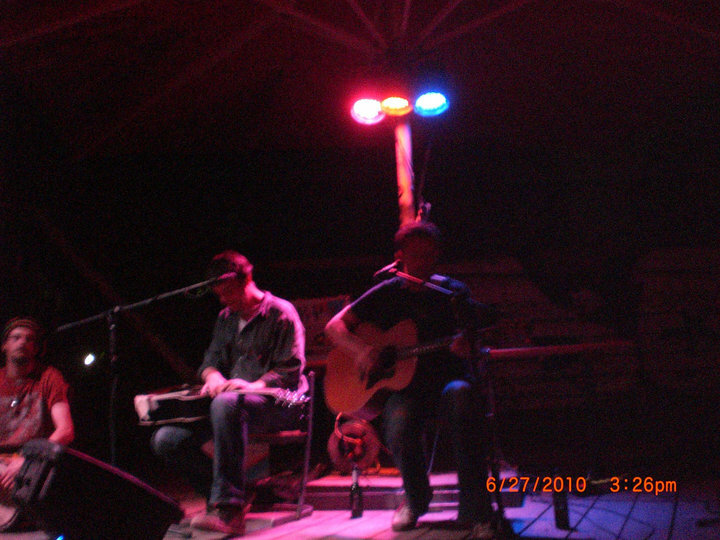 One particularly eventful evening, we decided to head to a venue nearby that promised to have a local band performing. A fellow traveler at our hostel who had discovered this place the previous night gave us the address and very detailed directions, but once we arrived within a block of our destination, all we could see was a relatively empty street of closed shops and old buildings. Just as we were about to head back to the hostel, we decided to wander into the dilapidated warehouse located at our given address. 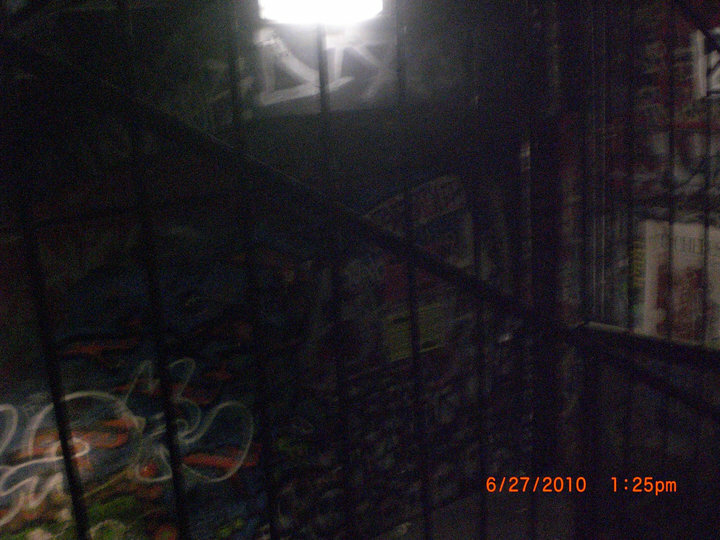 The photo below shows a part of the stairwell that led to the third floor. It all seemed bizarrely similar to the setting of a horror movie. And when we heard muffled noises coming from the floors above, we continued making our way up the stairs (this is usually the part of the movie where everyone thinks “STOP, don’t keep going!”). Probably not among the smartest decisions made during the trip, but it turned out to be one of the best! Upon reaching the third floor, we opened the door that was barricading the noise and found ourselves in a crowded dance floor. Working our way through the dancers, we continued through more dark, labyrinthine corridors and stairways until we eventually found what we were looking for, but not what we were expecting. The huge backyard of the warehouse resembled a scene fit for a Corona commercial, filled with sand and littered with chaise longues, deck chairs, and mini bars resembling beach huts, all surrounding a central stage. 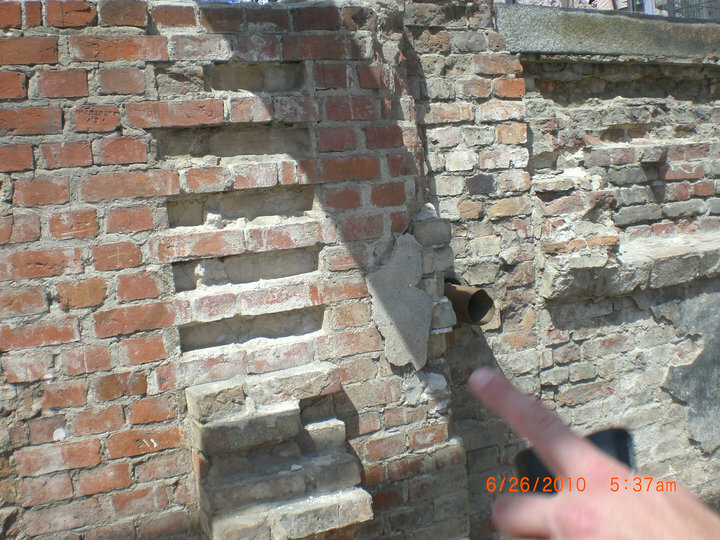 It was truly an incredible find, especially in such an isolated and unfrequented part of the city. Our timing was also perfect, as the band was just preparing to begin their performance! Listening to great music until the early hours of the morning, we ended up meeting quite a few interesting people and enjoying what seemed to be a popular yet well-hidden local hangout. 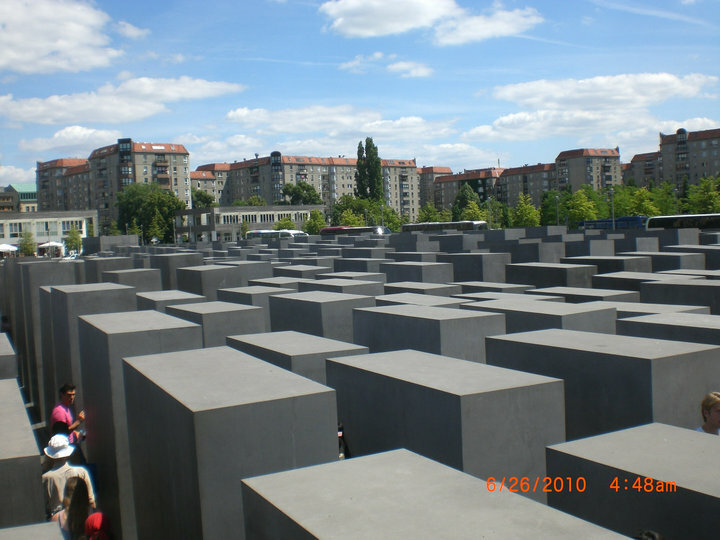 Our walk eventually brought us to the Holocaust Memorial, a large array of rectangular, grey concrete slabs (2, 711 of them), each with equal horizontal lengths but varying heights. 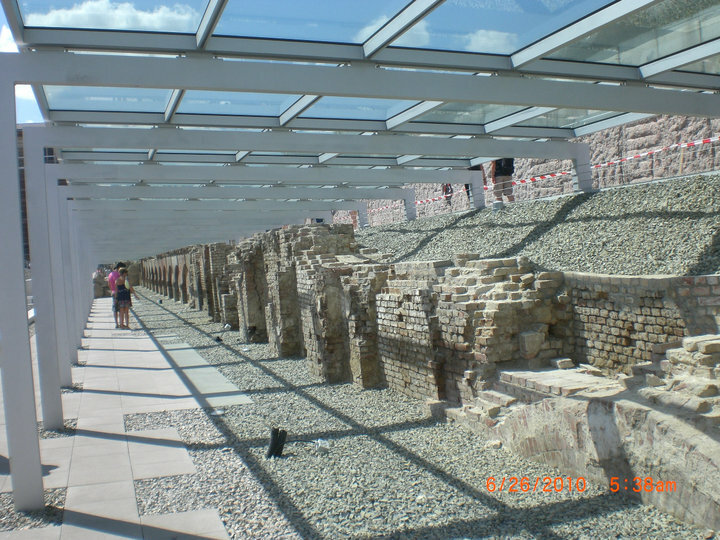 The field of steles rests on a Cartesian outlay of sloping paths that visitors wander through, becoming engulfed by the towering blocks surprisingly quickly as one advances through the structure. This was one of the features that struck me the most about the design, whether it was an intentional characteristic or not. 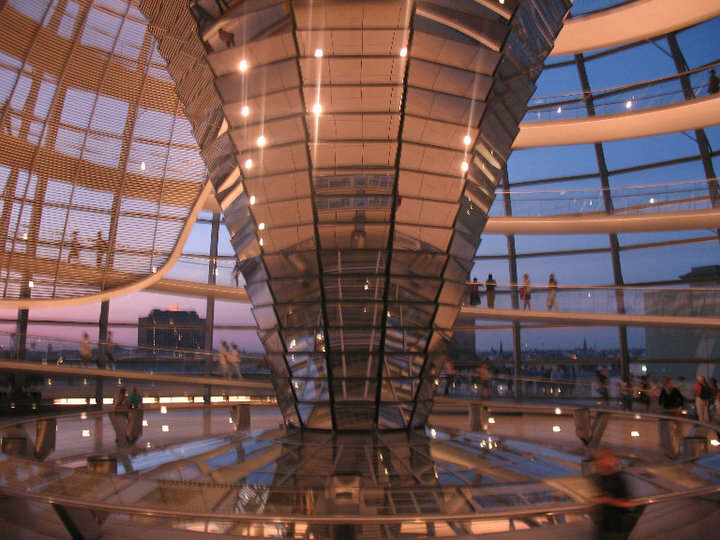 From a distance, the canopy of undulating, grey roofs is a calming presence, but when one enters the memorial, either by getting lost in the paths below or hopping along the roofs above, the rising facades that line the paths and the large drops that suddenly form below the surface become a frighteningly overpowering presence. Unlike most memorials I have seen, the “Memorial to the Murdered Jews of Europe” is integrated into the foundation of the city without acting as an obtrusive barrier to the ebb and flow of daily life, but rather becoming a part of it. Despite the long controversy behind its construction, I have great respect for this commemoration and the ability of its presence to draw people in and impart a unique meaning to each. 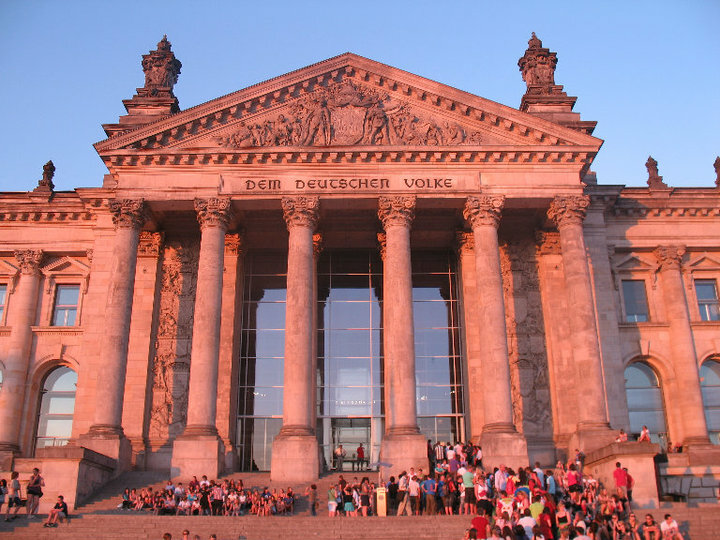 Our day of site-seeing ended at the Reichstag Building (Reichstagsgebäude), an elaborately designed structure that historically served as the meeting place of the German parliament, a role it still maintains today. 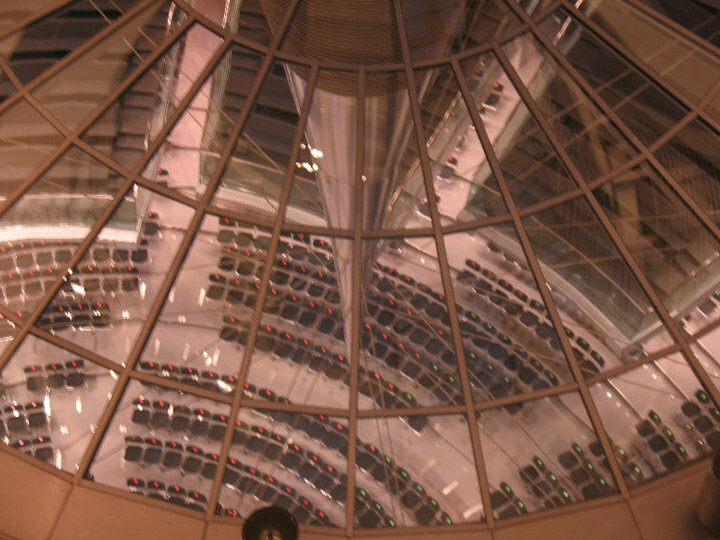 A fitting representation of Germany’s engineering and technological prowess, the building, with the completion of a full restoration in 1999, incorporates a large glass dome that not only provides a 360 degree view of the surroundings, but also utilizes an intricate arrangement of mirrors to direct natural light into the parliament floor. Further, the dome is equipped with an electronic sun tracker that shields direct sunlight from blinding parliament members and visitors. 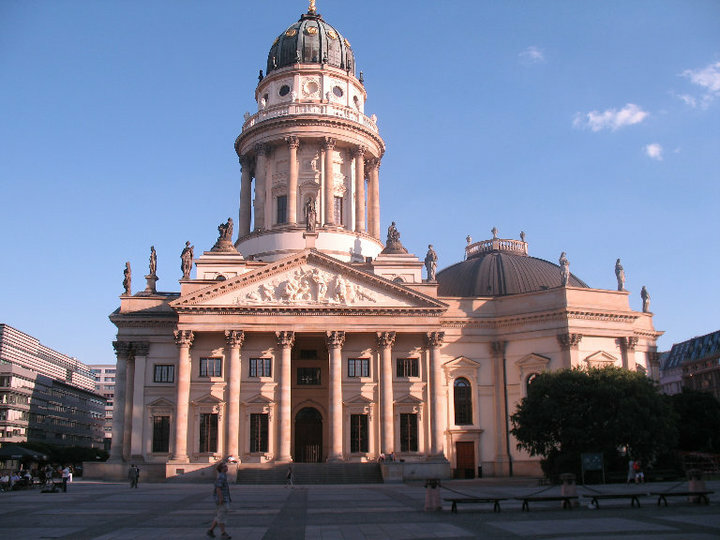 Our time in Berlin ended up being very laid-back, taking on a slower pace than our days in other European cities, while still managing to provide a plethora of good eats and pleasant surprises.